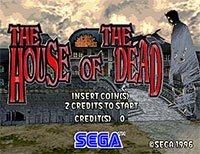 House of the Dead is another iconic shooting game (alongside Time Crisis) that shot up the arcades in the 90s and 2000s. Featuring less international espionage and more zombies, it certainly attracted a more adult audience, with plenty of gore on offer. The game itself has been through several different iterations in its years, each time improving on the graphics but retaining the same awesome gameplay. Screen sizes also increased, with some truly eye-dropping deluxe cabinets coming out in the last few years. At Liberty Games we have stock of several excellent House of the Dead cabinets, which can be reconditioned to the highest standard.